Note: Time has proven the research detailed here to have been on the wrong side of the facts, but at the time of publication this was still very much an open question. After miners unearthed a skull and bones in a Neander Valley cave in Germany in 1856 - three years before the publication of On the Origin of Species - the remains were initially described either as those of a 'brutish' race or someone disfigured by disease. As Darwinian evolution caught on, so did the realisation that these fossils were evidence of an earlier human species. Scientists have been debating Neanderthal's place in human evolution ever since. An ongoing question concerns the possibility that Neanderthals and early humans mated, since they likely crossed paths during thousands of years of European cohabitation. In a 2004 study, Mathias Currat and Laurent Excoffier presented a simulation model based on what was then known about the population density and distribution in Europe of Neanderthals and anatomically modern humans, Homo sapiens. Their results complement then-recent genetic and morphological evidence indicating that early human and Neanderthal interbreeding was unlikely. The twentieth century notion that modern Europeans directly descended from Neanderthals has mostly yielded to two competing models: one postulated that modern humans arose in Africa after 200,000 years ago and completely replaced coexisting archaic forms with no interbreeding, while the other proposed a gradual transition with interbreeding. Though mounting genetic evidence (based on mitochondrial DNA extracted from fossils) suggested by the start of the twenty-first century that Neanderthals and early humans did not interbreed, the evidence to that point was inconclusive. It was thought possible, for example, that any Neanderthal gene 'leakage' could have been lost through genetic drift if the mating populations were small. And because so few fossils were available to analyse, previous studies could rule out only Neanderthal contributions over twenty-five percent. Currat and Excoffier's model refined various parameters - such as geographic boundaries, local population variations, range expansion, and competition for resources - based on archaeological and demographic data for both populations. Evidence suggested that modern humans replaced Neanderthals over a time span of 12,500 years, for example, which constrained the speed at which modern humans could expand. The authors started with a scenario based on a set of 'plausible' parameter values - their basic scenario - and then varied the local interbreeding rate and, for example, the population size and location of Homo sapiens, to produce eight alternative scenarios describing how the Homo sapiens colonisation of Europe may have proceeded. They estimated the likely proportion of Neanderthal gene contributions to the modern gene pool using 'coalescent simulations', which generated the genealogies and diversity of genes in local populations based on simulations of their population densities and migration histories. These simulations showed that if Neanderthals bred with Homo sapiens without constraint over thousands of years, Neanderthal contributions to the modern gene pool 'would be immense'. Surprisingly, the simulations also showed that even a very small mixing should lead to high levels of Neanderthal DNA in modern humans [which, by 2017, has indeed proven to be the case in a large number of DNA samples from modern humans themselves]. What could account for this counterintuitive 2004 result? 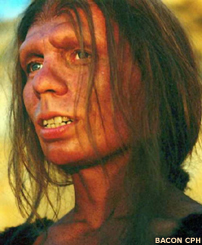 Given a low population density with small local breeding populations, any introduction of Neanderthal genes would decrease the frequency of Homo sapiens genes in that population; if these Neanderthal integrations took place as the Homo sapiens population was expanding, newly acquired Neanderthal genes would also be amplified. Since no Neanderthal mitochondrial DNA had been found in modern-day Europeans by 2004, the authors modelled the maximum number of interbreeding events that would support this observation. 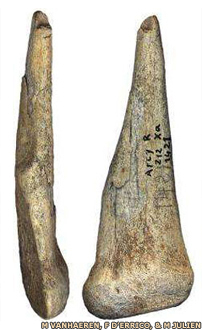 The estimated maximum number of events, it turns out, fell between 34 and 120 - extremely low values, Currat and Excoffier concluded, 'given the fact that the two populations must have coexisted for more than 12,000 years'. While the authors acknowledged that their simulations suggested rather than reflected reality, their model did incorporate real historical data such as Homo sapiens expansion over time and local population growth. At a value of only 0.1%, their estimate of the rate of interbreeding was about four hundred times lower than previous estimates and provided strong support that Neanderthals and Homo sapiens did not interbreed. Citation: (2004) Cro-Magnons Conquered Europe, but Left Neanderthals Alone. PLoS Biol 2(12): e449.